No, I am not talking about me, but instead, about a Christmas gift. I am not even looking at the rest of the list, with its chattering stream of to-dos waiting for the needles and hooks. Actually, I am not stressing over it, but I am trying to keep at it. The list merely contains ideas and suggestions, and is a nice place to start. What excites me more than this completed knit is something I picked up at the store while someone else was being a sleepyhead. Shhhh...he cannot stand surprises, or the idea that there is a present here in the house waiting. For the health and sanity of both of us, I hope it remains below his radar. Enough about that, let's get to the fo. 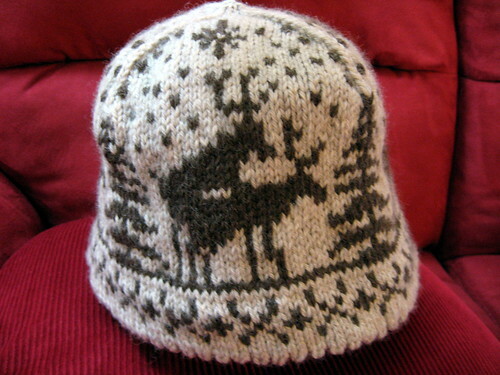 I made a Misbehaving Moose hat. I really enjoyed knitting it. As a matter of fact, I do have supporting evidence for that claim. I have already begun another. It will be a partner to the first. I think these are fun hats, and I am glad to be able to send them to their recipients, soon. I want to be sure that the presents arrive in a timely manner. You know how I can be with the post office. Since I gave away mine, I need to get a new fake head for my model. I have learned some things. I should have gone straight back to the store to replace the head after I gave away the first one. I should not have spent all of that time on eBay looking at other possibilities for displaying my knitwear. I do not need a mannequin. I do not need mannequin parts. I would have to knit many more socks to justify buying those legs. Fake hands to model gloves and mittens would be great, but finding a good matching pair is more of a challenge than I would have thought, and also, refer to sock/leg statement above. My neighbors already think I am weird enough when I take pictures of my knits outside without seeing me with fake people and body parts as models to assist me. Spending hour after hour online looking at mannequins, messes with my head. Still, that silver inflatable one is relatively inexpensive, although it is headless, handless, and footless. The fo for the post I had ready to go for Friday was temporarily kidnapped before its photo session, so it will have to wait. Then Blogger ate my UM. So, I give you puppy photos of Poppy and Violet (more of my mom's babies) and redo the Unconscious Mutterings. Happy Saturday, and I hope your weekend is great! However, just in case, I got this brain-munching maniac out of my home. After hearing how much my brother enjoyed Zombieland, making this birthday gift seemed like a--wait for it--no-brainer. I gave him his present Saturday evening at the party. We were hoping for a marshmallow fire, but our abundance of rain put that off for another time. I am pleased with the finished Corporate Zombie. I took my time and worked a little bit each day. I thought that I had red felt for the dripping blood, but think it turned out for the best that I had to embroider it instead. The assembly and embellishing details took the most time. They are also what made it something I feel good about giving as a gift. It is a painstaking undertaking, but worth it. 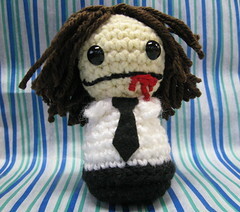 Throughout the creation of this creature, I more closely studied the book containing the pattern, Creepy Cute Crochet. It is a good little book, filled with interesting characters to crochet, as well as some helpful information for making them. I also saw that the perhaps the editing process took more from the book than it ought to have. For example, it states on the back cover, "...more than 20 unique patterns for totally loveable zombies, ninjas, Vikings, vampires, aliens, robots, and even Death himself." Well, amongst the 21 patterns, there are no Vikings. If the author had been allowed perhaps a dozen more pages, this volume would have been outstanding. Still, there are ways to access information that I think should have been in the book. Over on the website, she offers expansion pack patterns that can be made if you already have the book. I think I want to make The Valkyrie. There are also great tutorials, including this one to help with hair. I definitely needed that help. The book could have really used this additional information. I am just glad that I did a little search and ended up at the author's site. It made all the difference, and I finally put that old hairpin lace tool to use. 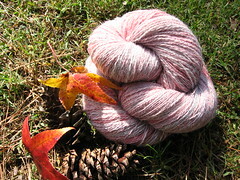 I only have UM for today, but I promise an FO for Columbus Day (yeah, I know). She's Not Available Right Now, May I Take a Message? Am I treading water? No, that involves more movement, coordinated effort, and concentration. It is more like a combination of brain in a dense fog and body suspended in Jell-O. It is difficult to get anything done or know determine which way to go, it is exhausting and confusing, but the Jell-O keeps me from sinking. Overall, I guess that last part makes it a net positive. I have been reading blogs, but just not been able to coherently comment. That does not usually stop me, but lately, it has. I have been marking everything unread in the feed reader with the idea that I will go back and comment, but I may need to let go of that idea. While I may not be able to tell you the day of the week, I do know what week it is. It is National Spinning and Weaving Week. I made it out to a kickoff party the other day at Little Barn. Even with my odd state, it was an interesting time.